Featured Series – Spotify: Playlist Pitching. The gatekeepers of hit songs used to be many: record label and publishing company execs, radio programmers, brick and mortar outlets and distributors, just to name a few. Today though, in an increasingly streaming-driven era, a select few curators hold the keys to arguably today’s biggest hit-makers: Spotify playlists. Radio is of the past – it’s not relevant… Being from radio, it’s sad to say, but that’s really the truth of it. But how, as an indie artist or manager, to make inroads on Spotify playlists with no influential connections? That’s a question that has been asked innumerable times, and for good reason. Our short answer? Start small, and scale pitching efforts gradually over time. Even relatively small playlists can lead to steady growth – and, importantly, some much needed income – for fledgling artists! Based on our personal experiences, we’ve compiled a comprehensive and detailed step-by-step guide to pitching Spotify playlists – a formula that has led to real results, if not always easy ones. Here are our tips! This is our tried and true method of playlist pitching which has earned us hundreds of thousands of streams over the course of several months. It’s slow but steady work with marginal but increasing returns. Using the Spotify desktop app, use a keyword search, for instance, to identify playlists that are independently owned. Hint: search not only by genres or styles of music (e.g., “beats,” “trap,” or “electronic), but also by use cases (e.g., “study” or “relax” for chill music). The beauty with pitching independent playlist owners is that many of their list adds are indefinite; put differently, as opposed to official playlist placements whose shelf life may only be a week or two, indie playlist owners are likely to leave you on a list for months, years even. This ensures that all growth, slow as it may be, is cumulative. A great hack for finding playlists is to identify artists with similar sounds and, with the desktop app, search for the playlists that are giving them the most listeners, as identified in the “Discovered On” section in the “About” tab. The “Discovered On” section is an awesome way to identify potential playlist owners to whom you can pitch. It is super important that you focus on two metrics when evaluating which playlists are worthwhile: (a) follower count – where anything over 1k is generally a legitimate option; and (b) number of songs – the less, the better. 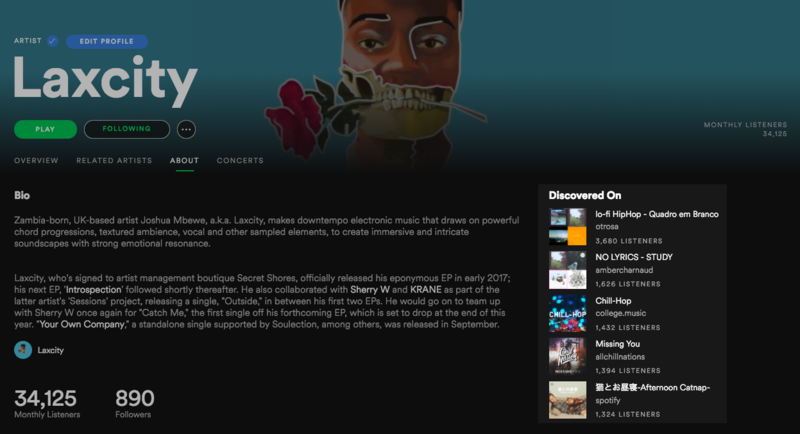 Note: Other sites like Spot On Track can give you more refined analysis on the playlists a particular artist has been and is currently added to, but the desktop app within Spotify is a great and easy-to-use resource that simplifies the playlist discovery process. 1) Always check the playlist description to see if a user has included submission instructions (e.g., an email at which they are reachable, or in the below example, instructions on where to find them on social media). Many playlist owners provide an open invitation for pitching, whether via email or otherwise. Take advantage of this! 2) If that fails, click on the person or organization’s name to pull up their profile. In either case, Google them using keywords such as the playlist title; search for them on Twitter and Facebook, too. Hint: to take things to FBI level detective work when playlist owners aren’t showing up on Facebook, search their “Following” list for a distinct name that will appear at the top of Facebook search results. Then search said person’s “Friends” on Facebook to find the name of the playlist owner. Hint Two: match up Facebook and Spotify pictures. Because most users have integrated their Facebook and Spotify profiles, this is a sure way to know you’ve got the right person. Using the Facebook profiles of people the playlist owner is following is a super easy win for finding them! 3) If you still can’t find someone after searching Google, Facebook, Twitter, etc. don’t give up just yet. Try searching for the playlist name and/or URL in quote marks – this ensures exact results only – and see what comes up. Often times users will have totally different account names on different social media sites, and may have people tweeting at them about a playlist, for instance, or include a link to said playlist in their bio, so you can put the pieces together in that case. When reaching out, always begin with a positive and earnest message. Complement the playlist owner on their selections, making reference to a few specific artists or songs as appropriate. Make small talk too, then, and only then, ask if they would mind you sending over a track for consideration. Most people owning small playlists with a few thousand followers will be super happy to hear you reaching out and are happy to take a listen. Once you’ve reached out, it’s of utmost importance that you keep tabs on responses. This is a crucial step in ensuring that all communication channels are sorted for future use, and that the so-called pitching funnel is tracked – i.e., how many reach-outs actually resulted in adds? Apart from personal reach-outs which will always be our favourite method of communication, a number of intermediary services now exist for playlist pitching. Undoubtedly the most popular and widely-used of such services is SubmitHub. This platform boasts thousands of playlist owners who are pitch-able using either standard or in some cases only premium credits – the latter bunch cost a nominal fee of about $1 each. Work Hard Playlist Hard and SoundPlate are a few other examples of intermediaries. Some large indie organizations such as Indie Mono have their own websites dedicated to submissions, too. While we’ve never used one of them personally, and have heard very mixed feedback, services such as Playlist Pump have started to pop up all over the place, all claiming to offer comprehensive pitching services for what usually amounts to quite a hefty fee. Caution should be exercised on this front as results are never guaranteed. You’d be surprised what pitching, using the above-mentioned first method in particular, can accomplish. We took our one management client, Laxcity, from effectively zero Spotify presence as of February, 2017 to 30k+ monthly listeners as a baseline number (it’s been as high as 60k+ in spikes). And the best part is, 90% of his playlist adds came from indie owners with lists totalling less than 10k followers. This stuff really does work, it’s just a matter of working hard, going out there and getting it!